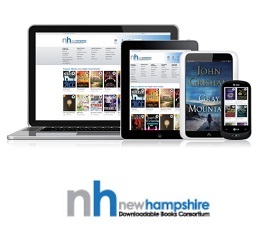 You can borrow eBooks and eAudiobooks through Cloud Library, the NH Downloadable Books Consortium, and hoopla. You can borrow a Nook or Kindle from the Library. You may also use hoopla to download music albums, movies and TV shows to your tablet or smartphone. Easily borrow eBooks and eAudiobooks with Cloud Library. This service is compatible with most devices, except Kindle eReaders. Borrow thousands of eBooks and eAudiobooks. This service is compatible with almost all devices. You will need your library card number to sign into Overdrive. You will need your library card number and password to sign into Cloud Library. Click here if you need to reset your password. eBooks and eAudiobooks may be checked out for two weeks. You may borrow up to 6 Cloud Library books and 3 Overdrive books at a time. You may place up to 5 holds on titles that are currently checked out. You must check out held items within 48 hours of being notified that they are available. Some Overdrive books can be renewed. Cloud Library books cannot be renewed. You may check them out again if no one else has placed a hold. Best of all, you do not need to return these items. They will be returned automatically. Reference staff are happy to assist you with this service. Please call, email, or stop by with questions. Thank you to the Samuel P. Hunt Foundation and the Bedford Library Foundation for contributing to Cloud Library.